The Pink-footed Goose, often referred to as ‘pinkfoot’, is a migrating goose species with two bio-geographical populations: The Iceland/East Greenland population wintering in the British Isles and the Svalbard population staging in Norway and wintering in Denmark, the Netherlands and Belgium. This website is dedicated to the Svalbard population of the pink-footed goose. 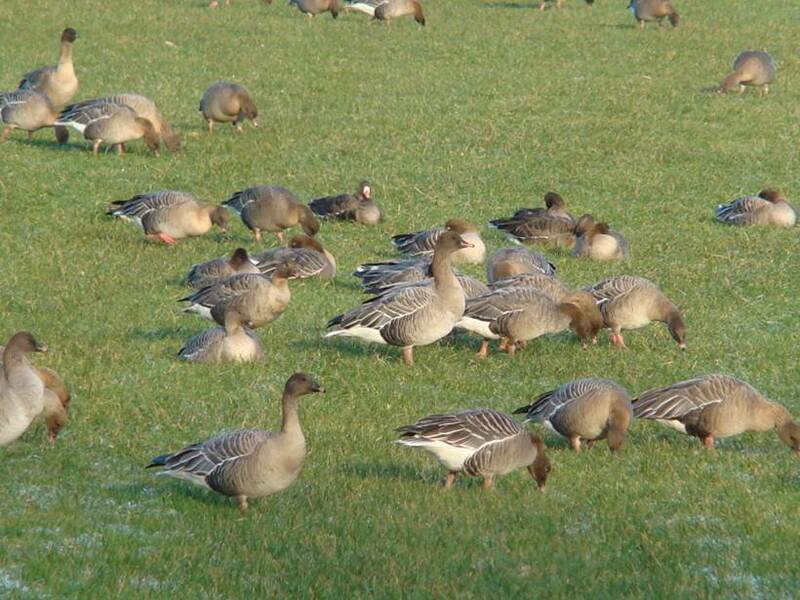 Breeding: As suggested in its naming, Svalbard is the breeding area for this population of the pink-footed goose. Most pinkfeet breed in western Svalbard (primarily Spitsbergen). They arrive around the middle of May, lay eggs in the last week of May and in early June and then leave Svalbard about the middle of September. Autumn migration: Around mid-September is when most pinkfeet depart from Svalbard and the vast majority migrate along the coast of Norway but some flocks have been observed migrating through Sweden and the Baltic region. A key autumn staging area in Norway is Trondheimsfjorden (mid), with short stops also observed in Vesterålen (north), Helgeland and other areas in southern Norway. Flocks can stay in Norway until late November but depart with the first snow cover. Some flocks also fly, more or less, directly to staging areas in west Jutland, Denmark or even Friesland in the Netherlands. Wintering: The wintering grounds for the Svalbard population of pinkfeet are divided between Denmark, the Netherlands and Belgium. The movement of pinkfoot flocks between wintering sites is highly dynamic; depending on several factors such as weather conditions, levels of disturbance and food availability on the staging grounds. Numbers peak in West Jutland, Denmark during October although some flocks (increasingly over recent years) stay behind and remain throughout the winter, depending on snow cover. In the Netherlands, numbers peak during October-November with the geese congregating in Friesland and the Vlaardingen area in South West Holland. After which the majority migrate on to the Oostkustpolders, Flanders in Belgium with numbers peaking during December-early January, followed by an early and fast northwards migration to the west coast of Denmark. 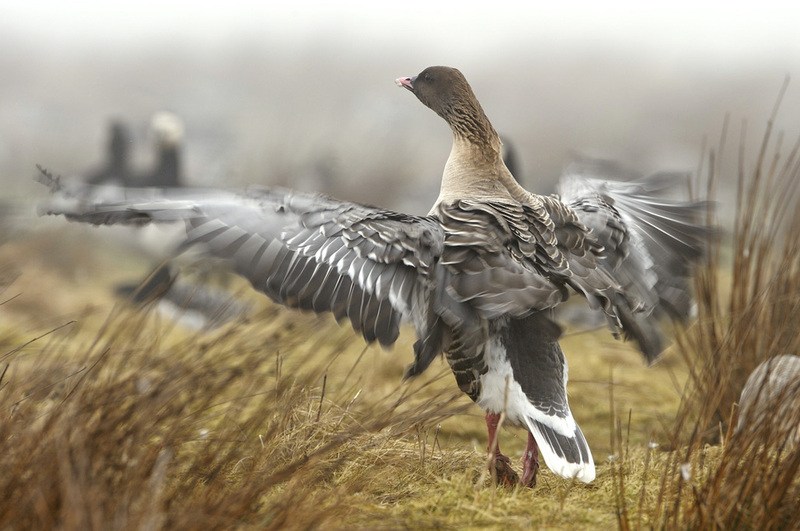 Spring migration: Traditionally pinkfeet stayed in Denmark until the first week of May and then migrating non-stop to the spring-staging grounds in Vesterålen and Lofoten in north Norway. However, since the 1990s, increasing numbers of geese have discovered and exploited areas in Trondheimsfjorden in mid Norway. The start of the spring migration from Denmark has advanced by more than a month and, nowadays, the majority of the population stops in Trondheimsfjorden over 3-4 weeks, with numbers peaking between late April and mid-May. Vesterålen is used during May, with peak numbers during the second and third weeks after which they leave for Svalbard. Generally, as the population has increased in size, pinkfeet have expanded their use of sites on staging areas as well as the wintering grounds, although remaining faithful within traditional core areas. There is evidence of increasing inter-species competition between pinkfeet and other goose species, particularly Greylag Geese Anser anser and Barnacle Geese Branta leucopsis, resulting in local displacement of pinkfeet. Along with many other migratory goose species the Svalbard population of the pink-footed goose has benefited from various international agreements that protect bird species and their habitats. The population has prospered over the past few decades and it has increased substantially from about 10 thousand individuals in the early 1960’s to roughly 80 thousand today; a success story for conservation efforts both nationally and internationally. If you would like to learn more about the current population status of the Svalbard pink-footed goose please see the latest Population Status Report. The success of Svalbard pink-footed goose is good news but the increase in its population size is posing several dilemmas for authorities, both nationally and internationally, in balancing a thriving goose population against increasing economic costs and the potential for environmental damage, as well as ensuring that hunting of the species is sustainable. Agricultural conflict: In recent years the rise in the population has progressively brought pinkfeet into conflict with agricultural interests in its wintering and staging areas. In some regions, particularly mid-Norway, farmers suffer notable losses due to crops being damaged by geese foraging in their fields. Tundra degradation: At the same time the continued growth of the pinkfoot population could threaten tundra vegetation on its breeding grounds in Svalbard, with the potential for long term environmental damage. Sustainable hunting: The Svalbard population of the pink-footed goose is a huntable goose species in both Norway and Denmark. The hunting of pinkfeet is currently at a moderate level and this is considered one way to regulate the population size. Nevertheless, to ensure that hunting in both Norway and Denmark is sustainable the impact of hunting is monitored and evaluated annually, with several projects started to optimize the organization of hunting of pinkfeet and minimize the risk of wounding. For more details about predicted sustainable hunting levels please see the Adaptive Harvest Management Report 2013-15. These are some of the management challenges that the International Species Management Plan for the Svalbard pink-footed goose sets out to address, so that its living conditions and habitats are secure along its flyway, whilst helping to minimise agricultural conflicts and ensuring that the hunting of pinkfeet is sustainable. For more information on the management of the Svalbard pink-footed goose please see the AEWA International Species Management Plan and the other actions being taken visit the Activities section of the website.